I will DM you test results (and anyone else who wants them). The fact is Wiped Film does not fractionate cannabinoids meaningfully. If you run correctly there will be a very even split between heavy constituents going to residue, cannabinoids going to the condenser, and volatiles going to the cold trap. At this level, you will not even experience much improvement doing a 2nd pass because the 1st pass was already the cannabinoids and very little else. On the contrary, if you get better numbers on a 2nd pass, that means your first pass had carry over from one of the other fractions as a result of bad parameters or pre-processing. In response to the claim that i’m getting horrendous losses that is just not true. The only processing step that can incur much loss is winterization same as a lot of people. DM sent. Immediate job opportunities with a fully permitted facility operating around the clock with 30+ employees. Currently, i’m doing consulting for several people who reached out to me on here. I am definitely open to taking on more! 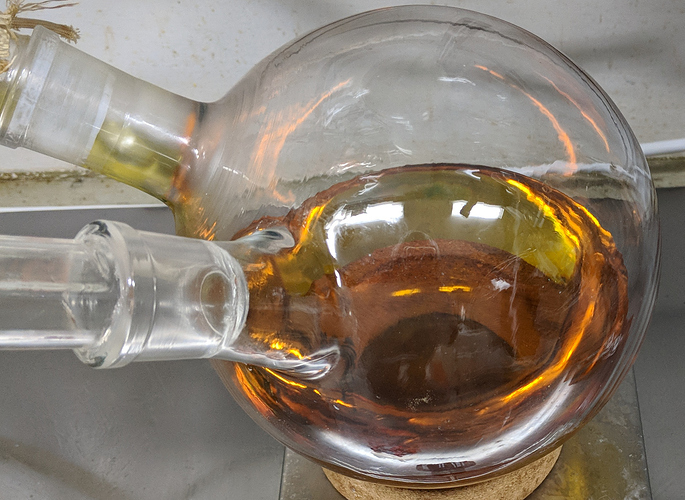 Here is a test result on some first pass wiped film distillate I made recently (company name redacted), and a pretty picture to boot. Please explain how the unsaturated benzene ring gets reduced to cyclohexene without any palladium and hydrogen? Aromatization from THC to CBN is possible through harsh conditions, but going CBN to delta 9 is not happening. I certainly don’t believe it. Nor does it even match what i’m describing because CBN is included in that total cannabinoid number. That’s what I’m talking about. Nicely done. I take it there is a “secret” to your parameters. Hi are you still looking for work? We are a large Hemp processing facility in Oregon and are looking for quality exp people. Please let me know your exp and availability? If you would like to work with me I would be happy to consult. I can also consider full time work if it’s a good offer. What is your salary reqs for the full time work? Are you able to relocate, at least for the term of work etc?? I DMed you some information.